Wheel bands are an easy to install color styling accessory for the outer rim of your alloy wheels that are available in many different color combinations! These wheel bands don't just look good - they can help reduce or avoid minor scratches and scuffs to your rims that can come from road hazards and curbs during low speed maneuvering situations such as parallel parking. While these wheel bands are quite durable, they cannot always protect your wheels from potholes and curbs while driving at road speeds. 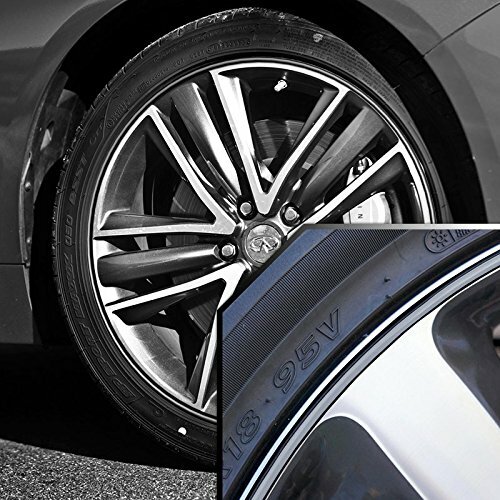 These wheel bands feature a patented system that uses a snap-in plastic color insert, a plastic mounting track and 3M's automotive acrylic foam adhesive tape which is pre-applied to the mounting track during the manufacturing process and is ready to adhere to a clean surface. The replaceable color inserts snap snugly into the mounting track and both can be easily trimmed to fit the rim of your vehicle. These wheel bands are a universal fit product for a wide range of wheel sizes and can be cut to fit wheels from 13" to 22" using shears. Wheel Bands will fit any wheel which has at least a 1/4-inch (6mm) wide flat surface around the rim. This surface should be free of any standing ridges caused by spoke design or by damage to the rim in order for the tape to maintain proper adhesion. These wheel bands may not mount securely to rounded or angled surfaces, so make sure your wheels have a proper flat mounting surface before ordering. Make sure to allow for some clearance between the track and your tire surface so that they are not accidentally removed or damaged by low tire pressure situations. Make sure to follow the included installation instructions for a lasting fit! Fits a wide variety of wheels from 13" to 22"
If you have any questions about this product by Upgrade Your Auto, contact us by completing and submitting the form below. If you are looking for a specif part number, please include it with your message.